In recognition of National Minority Health Month, the office of U.S. Rep. Danny Davis will host four press conferences in the coming weeks to promote minority health awareness. One of the press conferences will focus on men’s health, and another will take place at a neighborhood fitness center to promote exercise. Black Americans are affected by a number of health disparities, according to the Centers for Disease Control and Prevention. Forty-four percent of black men and 48 percent of black women suffer from cardiovascular diseases that includes stroke and heart disease, according to the CDC. Blacks also develop high blood pressure more often, and at a younger age, than other races, 46 percent among women and 43 percent among men. Nicole Harvey, director of constituency development for Rep. Davis, announced the awareness campaign at the Westside Ministers Coalition monthly meeting April 6. A stroke and heart attack survivor herself, Harvey said getting people aware of their health is most important, and she’s encouraging people to get checked out by their doctors. “We have 21 hospitals within our (7th congressional) district. There is no need for us to have any health disparities. We just got to keep making noise to make sure everyone gets access to health,” Harvey said. Lack of access is what most puts communities at risk, added Mark Kruger, outreach director of Special Projects for Oak Street Health, a Chicago-based network of clinics for elders. 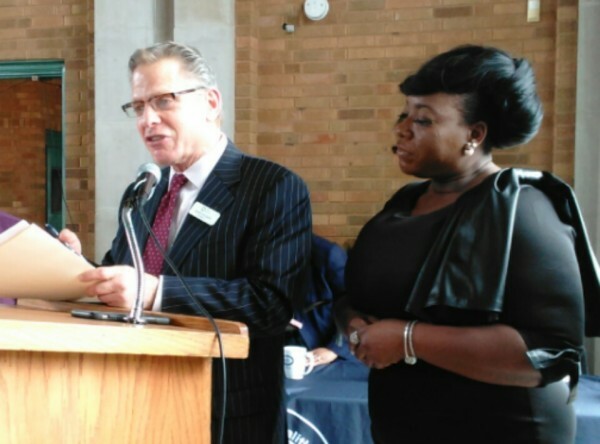 One of the press conferences is scheduled for the agency’s new clinic in Englewood. “Let’s ask ourselves: What puts people at risk for not realizing their full health potential? Inequities in our neighborhoods cut off access to resources that we need,” said Kruger, whose agency is partnering with Davis’ office. The congressman also has new legislation pending in the U.S. House of Representatives to address childhood trauma. The congressman filed the Trauma-Informed Care for Children and Families Act last month. Among the bill’s provisions is the creation of an “interagency task force” of federal, state and local health care representatives. Mental and behavioral health, as well as substance abuse agencies, would be among the representatives tapped to serve on the task force, should the U.S. Senate approve the legislation and President Trump sign it into law. Davis’ bill has been assigned to four House committees in Washington, D.C.: Ways and Means, Education and Workforce, Judiciary, and Energy and Commerce. Austin residents and the American Heart Association share risk factors and preventative methods for the condition that can lead to disability and death.